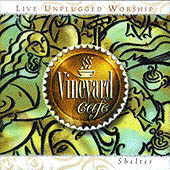 This new CD release, from the Vineyard Music Group, is an attempt at unplugged worship. The first song Hop on the Bus, a song written out of the experiences associated with the Toronto Blessing, is excellently done with the piano. The saxophone adds a small group atmosphere and blends well with the theme of the CD. The next track, an acoustical version of Throne of Grace, is deeply intimate and leads one to deep praise and worship of Jesus. In fact, this version is actually better than the original version on Vineyards Throne of Grace CD. I noticed from track one to track two, the atmosphere from coffeehouse to studio takes place. The music stays in the intimate unplugged mode, but you do not hear the coffeehouse ambience. The third selection opens up with mild percussion that adds a touch of elegance to this song. The intimacy, along with the mild percussion, continues in this song and carries to the fourth song Soften My Heart. The next song, the old hymn Great Is Thy Faithfulness, is beautifully done, with a refreshed emphasis on the words of the hymn. The serene surroundings continue with Lord, I Love You and the piano oriented version of I Love You, O Lord. The tempo picks up slightly with another old hymn Blessed Assurance. Track nine Thank You, Lord continues along in the same mode of worship leading into track 10 You Are Here. I began to wonder when I played track 11, if the coffeehouse atmosphere would come back into the recording. As Open Your Eyes played, I was still in that intimate worship mode that has existed throughout the CD. The next track, Oh Lord, Have Mercy On Me, is a very familiar song to followers of Vineyard Music. The intimacy is deeply felt and noticed along with the added presence of the mandolin. The last song has a mild increase in tempo along with the continuation of the mandolin in the background. On a scale from one to five, with one being poor and five being excellent, I give this CD a four. The music was excellent in presentation and brought one into the worship atmosphere. However, I was very dissapointed with the fact that the recording went from a coffeehouse atmosphere to a studio atmosphere. I expected to hear more of the audience environment throughout the CD. I feel that if more of the audience environment would have been heard throughout the CD, the CD would have felt even more serene and intimate to the listener and worshipper. I would recommend this CD to anyone who desires intimacy and loves worship in general. Bob Rouse <availablelight@christweb.com> lives in Wilmington, N.C. USA and is currently developing the webpage for Coastal Community Vineyard of Wilmington, NC USA. Bob is also the editor and webmaster of The Available Light webzine.